A group of snowmobilers cross a road during the Snodeo, Saturday, Jan. 21, 2012, in Rangeley, Maine. As a part of this effort, the two groups held a joint news conference Dec. 30 in Augusta about snowmobile safety and regulations. “We don’t want another situation like we had last year to cast a cloud over the entire season,” said Col. Joel Wilkinson of the Maine Warden Service. At the beginning of last year’s season, Maine game wardens recovered the body of a 45-year-old Yarmouth woman who went through the ice while riding a snowmobile on Rangeley Lake. Her 16-year-old son, who was riding with her on a separate machine, survived by leaping from his sled onto thicker ice and making his way to shore to call 911. In the same time frame, three men snowmobiling in Carrabassett Valley disappeared. After an extensive search, wardens discovered that the men also had broken through the ice on Rangeley Lake. Their submerged snowmobiles were discovered with an underwater remote controlled vehicle in February, but it wasn’t until May, after the ice had thawed, that the snowmobilers’ bodies were found and recovered from the lake. While not all snowmobile accidents end in such tragedy, of the 186 snowmobile crashes reported in Maine last season, 119 caused personal injury. During one weekend in January 2012, a rider collided with a moose in New Sweden; another rider struck a vehicle in Eustis; two riders were ejected from their snowmobile after losing control in a field in China; and another snowmobiler was ejected from his sled and hit a shed in Limerick after hitting the shoreline of Sokokis Lake. All of the snowmobilers suffered injuries of varying degrees. Approximately 90,000 snowmobiles are registered each year in Maine, and 80 percent of those sleds belong to Maine residents. according to the warden service and snowmobile association. And the most common contributing factors for snowmobile crashes are operating too fast for conditions, driving beyond the effectiveness of headlights and driving beyond operator abilities. 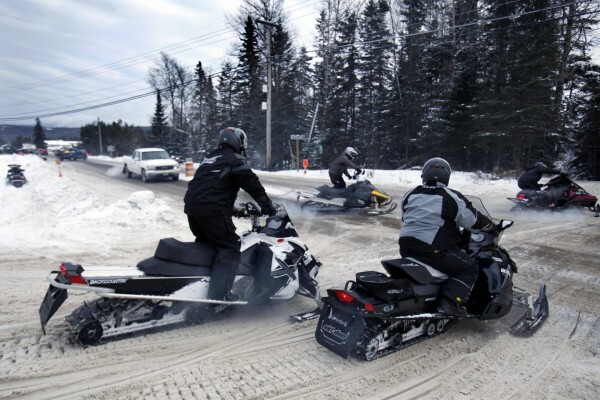 To reduce snowmobile crashes and search and rescue incidents, the groups asked that riders leave plans of their trip with people that they plan to check in with; pay close attention to ice conditions; and carry a phone so that, in the event of an emergency, they can dial 911. At the press conference, the groups also stressed that parents are responsible for children under 18, including their actions while operating a snowmobile. Also a main point of discussion was the importance of snowmobile rider-landowner relations. Most of Maine’s 14,000 miles of groomed trails are available by the generosity of private landowners. Staying on designated trails and refraining from modified exhausts will help ensure future private land access. To learn about the Maine Warden Service, visit maine.gov/ifw/warden_service; Maine Snowmobile Association, visit mesnow.com.